Ever since I first set eyes on the House With No Name, I’ve been addicted to reading books about France. Recently, as well as re-reading Francois Sagan’s Bonjour Tristesse, I’ve whizzed through Je t’aime la Folie by Michael Wright and, of course, Karen Wheeler’s wonderful trilogy about hanging up her high heels and moving across the Channel. And this week I’ve discovered another author who’s brilliant at bringing the intricacies of rural France to life. Julia Stagg lived in the mountainous Ariège-Pyrenees region for six years, where she ran a small auberge and “tried to convince the French that the British can cook.” Now based in the Yorkshire Dales, she’s written two novels about the inhabitants of a tiny French village – L’Auberge and The Parisian’s Return. 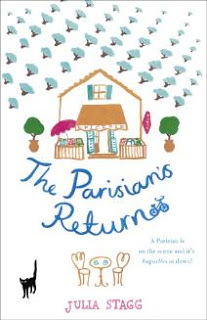 I’ve just read The Parisian’s Return and even though it’s set the opposite side of France to House With No Name country, it evokes the French way of life so vividly it made me want to hop on the Eurostar right away. The character at the centre of Julia’s novel is Stephanie Morvan, a single mother who’s moved to the village of Fogas to make a new life for her and her daughter. She works at a local restaurant and dreams of launching her own organic gardening centre. But the whole community is thrown into turmoil when Fabian Servat, the tricky nephew of the couple who own the village grocery, returns from his hotshot job in Paris to take charge of the store. Worse still, Stephanie almost kills him twice in quick succession – once by braining him with a stale baguette and then by crashing into his bike on a lonely mountain road. Charming, funny and authentic, the novel covers everything from inheritance law in France (complicated!) to wine (thanks to Julia I now know that if I ever come across a 1959 Bordeaux it’s worth a lot and I should sell it, not drink it). But the bits that resonated most were her wise words about the people who move to isolated villages in France to “get away from it all.” As she perceptively points out, the newcomers who make it work are the ones who keep their feet firmly on the ground, speak French and become friends with the locals. I agree about Franco-books. Can’t get enough of ’em. Have posted separately on FB, but will mention here Robin Fedden’s Chantesmesle about his time spent living near Giverny as a child. I too have an insatiable appetite for books in France, and that is despite living here for 8 years. I agree Julia’s books look to be a great read. Thanks so much for the recommendation, Jackie. I will look out for this one. Hope to see you at the Chipping Norton Lit Fest too! If you have any recommendations, Jacqui, I’d love to hear them. I’m always on the look out for great books about life in France. Thanks for the support, everyone. And a really big Merci! to Emma for this wonderful blog. Keep up the hard work! A pleasure, Julia. Readers who love France will LOVE your book!